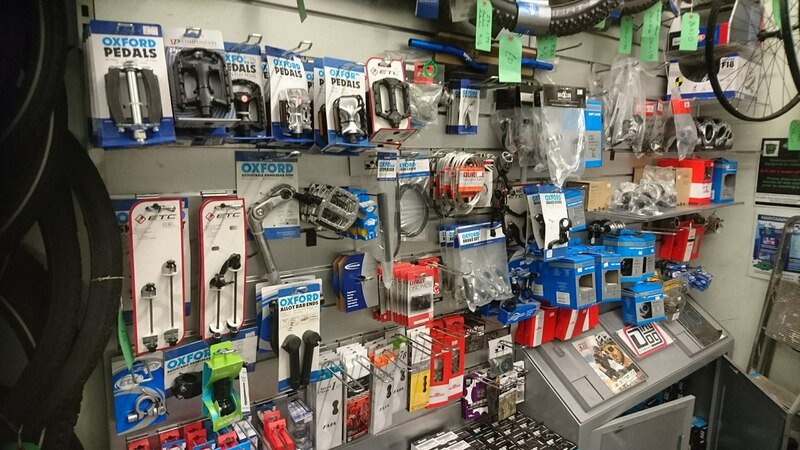 We stock an increasing range of cycle parts and accessories. We can advise on purchases and are able to offer special discount schemes such as subsidised locks and lights. Please pop in to catch the latest deals and special offers. 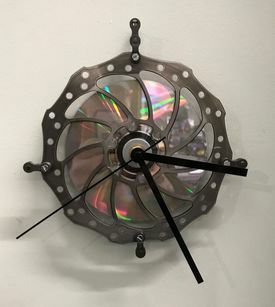 We can also order custom parts and high end products. Delivery times vary depending on availability we always aim to have the quickest delivery. As well as reconditioned bike and parts we can also supply you with brand new bikes ordered to your specifications. We have a range of different types and standards from ordinary family cycles through to more specialist models. 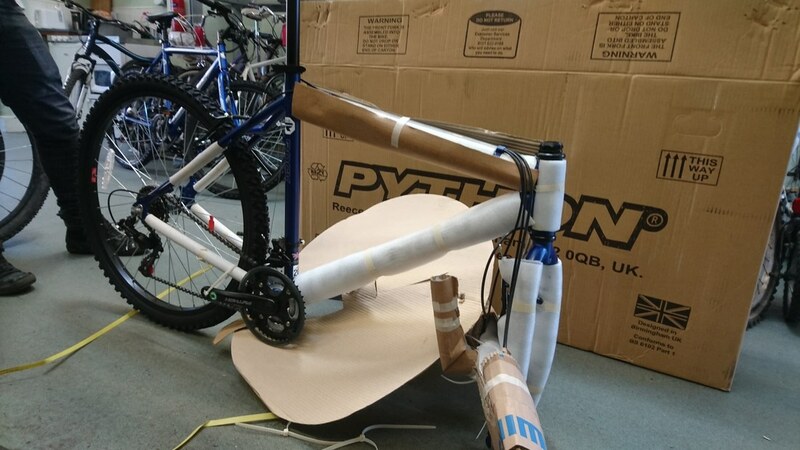 We also offer an unboxing service where we set up the bike and have it tested and ready to ride, even if you didn't buy it from us. All our recycled cycles are fully reconditioned ready to ride. You can try before you buy, just pop into the Hub and ask! We have a very fast turn-over of bikes and post the latest ones on our facebook page. Reserve a bike for up to 2 days. 14speed, 26" wheels, small 16" frame. 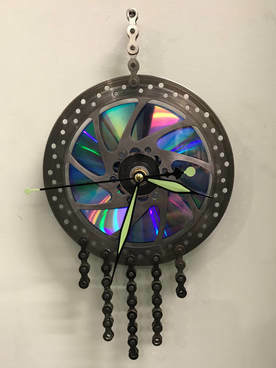 All these items have been carefully hand made from thoroughly cleaned recycled bike parts. Each one is totally unique. 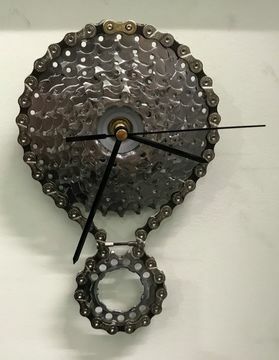 There are a few examples below They sell quite quickly so you are best to call in to see what we currently have in stock. 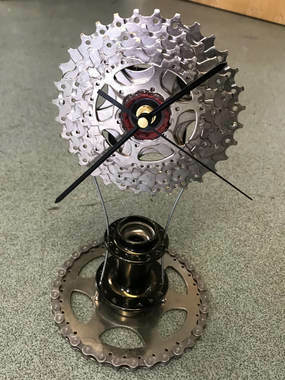 5 speed cassette cleverly suspended with spokes over a stunning bronze hub sat on a chainring and finished off with a section of chain. 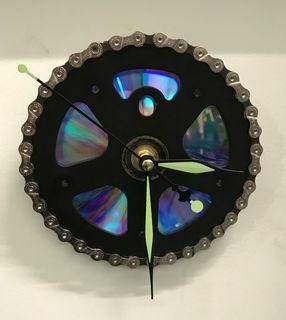 Made using a chainring, chain, colourful CD and luminous hands.